Do you like to read your Mail messages in their own windows, as you get when you double-click a message a mailbox? For many people this is an easier way to read e-mail, as you can control the size of the message window without changing the size of the whole Mail interface. The downside is that, despite what must be five years’ of users’ requests, Apple hasn’t provided a means of navigating from one message open in its own window to the next message in a separate window. That is, you can’t finish reading one message in a window, hit some hotkey or toolbar button, and view the next message in that same separate window. But with just a bit of help from a third-party program, you can create your own version of this command. To make this work, you’ll need a program that’s capable of creating a macro (a series of keystrokes) and assigning a global hotkey to that new macro. There are a number of programs that can do this, including QuicKeys X3, iKey, or Butler. In addition, this is probably also possible in LaunchBar and Quicksilver … and there may be others that I’m not aware of. The basic trick is to take advantage of the keyboard shortcuts that already exist in Mail, and combine them to create the behavior we’d like to see. I’ll explain how to do this in both iKey and Butler; doing it in any other macro-type program is left as an exercise for the reader. For both programs, the basic assumption we’ll make is that you’re reading your first message in a window of its own already, and want to move to the next one. Click the Plus sign again, and add another Keyboard:Type Key(s) event. This time, type a down arrow in the Key field—this moves Mail’s pointer down to the next message. Click OK, and then (you guessed it) click Plus again to add a final command. Add another Type Key(s) event, and set this one’s Key field to Return—press the Return key with the Key field active. Pressing Return with a message selected in Mail will open the chosen message in a new window. Click the OK button to return to the main iKey screen. You’re almost, but not quite, done. 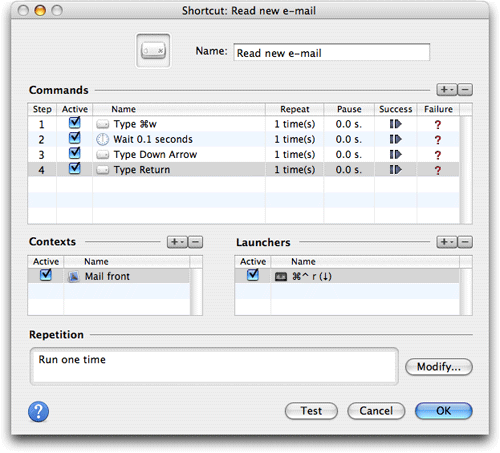 Now select File: Save and Activate, or just hit Command-S. Switch to Mail, open a message in a new window, and then hit your shortcut keys; the open window will close, Mail will select the next in line, and then open it in a new window. Butler’s configuration is simpler, as its macro engine implements things differently, and is probably a bit less powerful than that of iKey. Open Butler’s configuration screen (choose Butler: Customize from the Butler menubar icon). Click once on any existing entry in the Hidden section, then click on the plus sign at the lower left of the window. 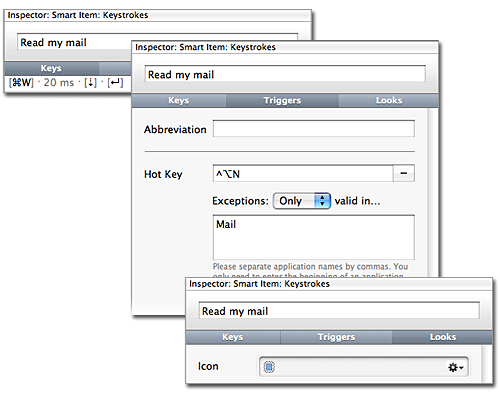 Choose Smart Item: Keystrokes from the pop-up menu, then find the newly-added Keystrokes entry in the Hidden section. Click on it to select it, then click on the word Keystrokes at the top of the right panel and give your macro a name (“Read my mail”). Now click on the Keys tab on the right side of the window, to make sure its active (it should already be active). Click again within the actual keystroke area below the Keys tab. This is where you’ll enter your macro keystrokes, so anything you type now will be recorded. Type Command-W (press the actual keystrokes, don’t type the words), and you’ll see the Command-W shortcut appear, in brackets, in the Keys area. Now click the plus sign at the bottom of the keys area and choose 0.02 seconds from the pop-up list—this is the delay to let the Mail viewing window close, and it’s equal to 20 milliseconds. (Which means that this version runs faster than the iKey version.) Then just click the down arrow and then the Return key to add those to your macro as well. If you make a mistake, press the delete key symbol next to the plus sign to get rid of it—if you press Delete, Butler will simply capture it as part of your macro. That’s it for defining the macro. Switch to Mail, open a message in its own window, and hit Control-Option-N. The message will close and, very quickly, the next one will open. Though not a perfect solution, using a macro tool to create a new command and make it executable via the keyboard is nearly as good. The Butler version, which is the one I use, is particularly speedy. Note that you may have to experiment with the delay values in either version if your machine is slower; slower machines will need a longer delay to allow the back window time to open.